We have an exciting video for you today. It is going to be all about the street food. We are here in Osaka (大阪市) in Dōtonbori (道頓堀) which is famous for nightlife and street food. We have come here in the middle of the day. We’re going to turn this into our lunch. And just try as many Japanese snacks and dishes as possible. Japanese street food for you guys. Okay so time for our very first snack. And we are starting with something sweet. This is called Taiyaki (鯛焼き) and it is basically a pancake shaped like a fish. So we got two different varieties. They have the classic which is stuffed with red bean paste. we have found a place serving Kushikatsu (串カツ). Round two guys of street food guys. So this is Kushikatsu (串カツ). This is basically they are fried skewers. Kushi means skewer. Mmhmm. Katsu means meat. This is our third snack here in Dōtonbori (道頓堀). And we found a gyoza (餃子) stand so we ordered up a little tray. This was 400 Yen and you get 8 pieces. And when it rains in Osaka (大阪市) it pours. It pours. Oh my gosh how the weather has changed today. So lucky we brought our umbrellas. But anyways we are moving on to our 4th dish right now. And we have something called Takoyaki (たこ焼き / 蛸焼). Takoyaki (たこ焼き / 蛸焼) is basically a ball shaped snack. It is made with batter. It has chopped up octopus. It has pickled ginger. Um and then once it is ready they put on a bit of barbecue sauce, some mayo and these little things that you see moving around. That is bonito flakes. It is fish flakes. Moving on to dessert. So take a look at this guys it is melting quickly. I’ve got a big scoop of vanilla ice cream (Monaka – 最中). I have red bean paste. Red bean paste and then I have uh an outer shell here. Alright so Sam had ice cream. I am having Warabimochi (蕨餅). And I kind of have to assemble this myself. So the mochi (餅 – もち) comes in this little plastic container. Oh that almost looks like jelly. Yeah. And then we’re going to have to add this powder on top. It is time to say goodbye. It is always sad when the street food tour is ending. Yeah. Because we just love street food so much. And I have to admit this is the first time we’ve ever filmed street food in the rain so it was an interesting procedure. Hahaha. 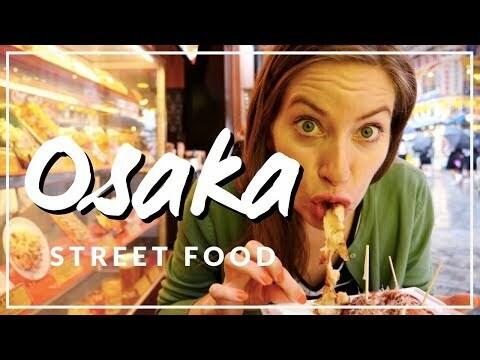 Anyways we really enjoyed this street food tour here in Osaka (大阪市) and if you want to see more Japanese food and travel content stay tuned because we have a lot more coming.